Meet our first three medal winners. The movement is underway, and gaining momentum. Athletes With Diabetes are writing in and receiving their medals for bravery and resilience in completing their important athletic goals. How did this get started? Like I mentioned on DSMA Live in November, I’ve always been a huge fan of athletes, and I’ve competed in several sports myself over the years. For People With Diabetes, the adjustment from non-activity to regular activity, plus the adjustment in BGs, basal rates, and boluses often requires a fair amount of bravery. 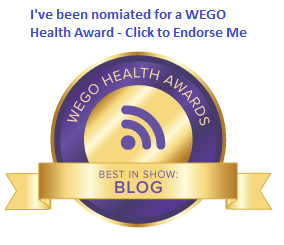 I don’t think People With Diabetes get enough recognition or rewards when they get out and compete, or even when they make a concerted effort to stay active. I had been thinking about that on and off for a while, and then I saw this video from Kerri Sparling at Six Until Me. In short, it was inspiring. 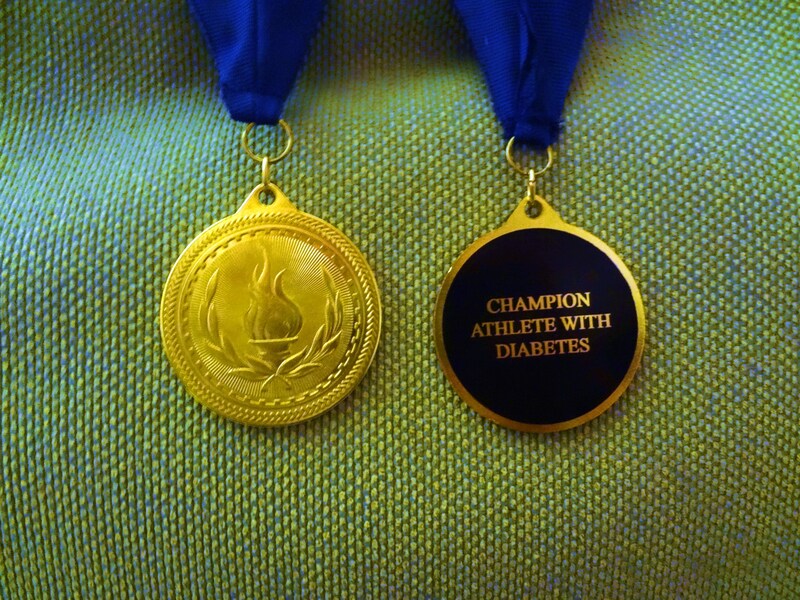 It inspired me to get medals produced and purchase certificates and create Twitter and Facebook accounts to promote the idea that all Athletes With Diabetes are Champions. Here are the first three Champions who received their medals. Mary Beth Wyss lives in Dayton, Ohio with her husband David. She has a son in the army, and a daughter in college. She’s also been living with Type 1 diabetes for nearly 30 years. About five years ago, Mary Beth decided to go to a boxing class. Five years later, she’s still with it. Five years of boxing class… wow! Congratulations Mary Beth. I’ll be sure to mind my P’s and Q’s next time we’re together. No need to put your training to use. Full Disclosure: Mary Beth is a college friend of The Great Spousal Unit, and she appeared in this space once before talking about her diagnosis and treatment of diabetic macular edema, and her participation in clinical trials. She is a dear friend. Jen lives in California, where, among other things, she writes the popular blog See Jen Dance. 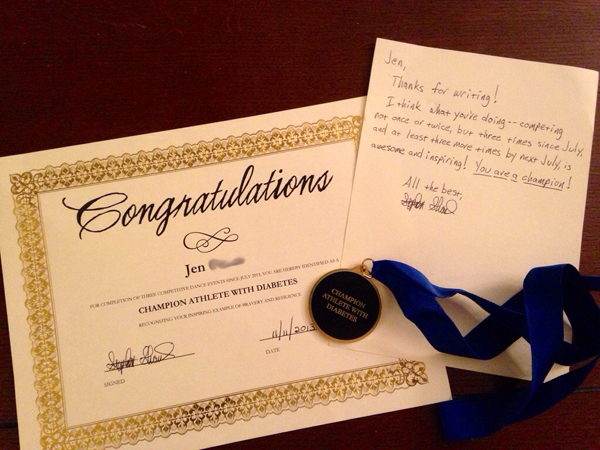 As you can imagine, Jen’s athletic achievement has to do with tripping the light fantastic. Not once. Not twice. But three times in dance competitions since July. And she’s planning to compete three more times before next July! 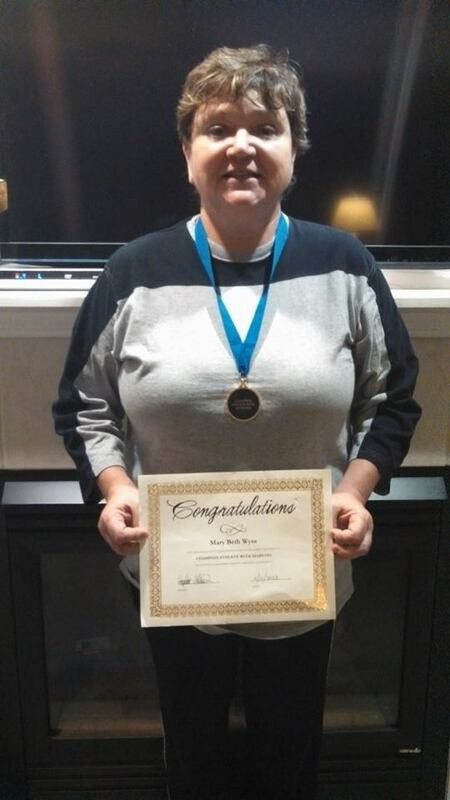 By the way, she also posted a photo of her certificate and medal on her blog, and they look great. Way to go, Jen! You are a Champion! Everybody knows Scott Johnson. Writer of the awesome Scott’s Diabetes blog, facilitator at Children With Diabetes events around the country, co-host of DSMA Live, friend and advocate and there-aren’t-enough-exclamation-points-to-describe-how-amazing-Scott-is. I’m sure the medal we sent him pales in comparison to the Insulindependence Athletic Achievement Award he received this year (partly because of the money). But for Scott, finishing the Rothman Institute 8K run in Philadelphia back in November was a huge milestone in itself. 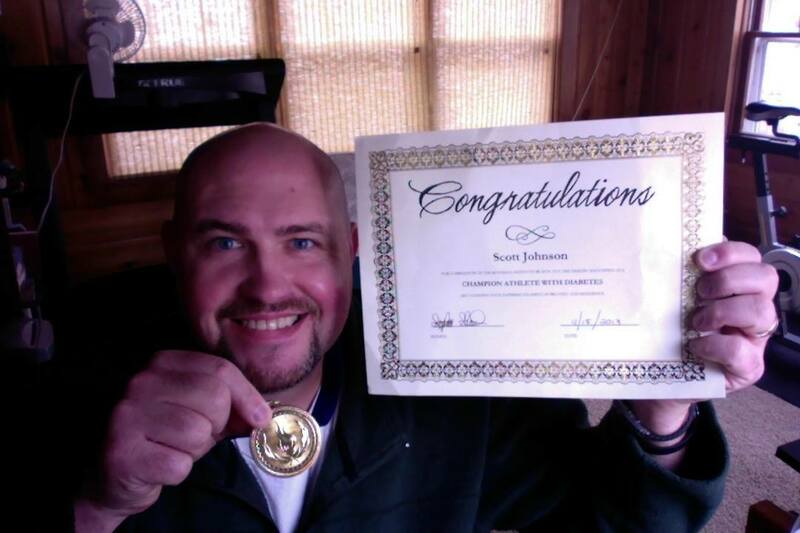 Congratulations Scott… Perseverance is like kryptonite to the diabetes monster. 2. The athletic event must have taken place in the last six months. For now, we’re going with a pretty loose interpretation of the word “event”. If you feel you’ve accomplished something important to you, that’s an event. This is all about you, not about stupid rules. ‘Nuf said. I think D-Athletes are amazing. It takes a tremendous amount of planning, effort, and bravery to compete, or maintain an exercise routine. Heck, sometimes, it’s everything we can do just to walk around the block. Getting out of your comfort zone and taking that brave step is something that should be recognized and rewarded. Congratulations again to our first three medal winners. Keep those e-mails coming, and let’s get the medal count up even higher! I hope you know how much I love love love this!!!! And I’ve set a goal to run a whole 5K without any walk breaks (which I’ve never done, even the year Pete and I ran three 5Ks). I hope I can do it, and I hope I can earn one of those medals!! Can’t tell you how much this picks me up today. Your support is so appreciated.